A rather typical Cottrell Boyce story, full of good-humour and also packing an emotional punch that seems rather at odds with its cover. In this story, short-listed for the 2017 Carnegie Awards, we follow a young boy called Prez. Prez is being fostered by a larger-than-life family as his grandfather is suffering from dementia and cannot look after him any more. Whether Prez is unaware of this or in denial about it is not immediately clear, but he is a boy who is having a tough time of it. This background to Prez’s story immediately warms us to him, but then things take an unexpected twist when Sputnik arrives on the doorstep of the Blythe family. 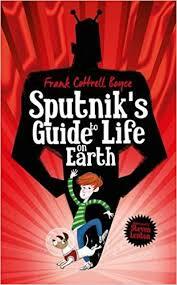 Sputnik, to everyone else, looks like a dog but to Prez he reveals himself to be an alien come to Earth as part of a mission to find ten things to recommend about Earth in order to save it from part of a galactic tidy-up. What follows is utterly fantastic, but tremendous fun that will certainly appeal to younger readers. There are some wonderful comic scenes – Sputnik interfering with the toy lightsaber and turning it into a weapon of destruction, and the ‘break-out’ of a busload of young offenders were amongst my highlights – and yet increasingly coming to the fore is a focus on the relationship between a young boy and his grandfather, two like-minded souls who have to come to terms with their shifting relationship. While I don’t see it as a winner for the Carnegie – it seems to be in the wrong age-group for the intended audience – this was a surprise hit.